My new monthly column at Patheos Pagan's Agora blog started May 23rd. I'll be copying posts from there to here after a few weeks, for archival purposes. 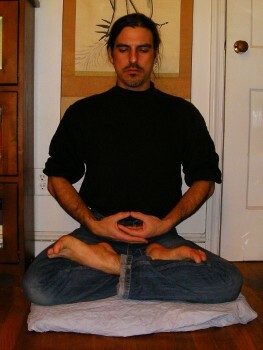 Anyone can look serene in this posture. Hello! Welcome to The Zen Pagan. “The what Pagan?” some Pagan readers may be wondering; and perhaps “The Zen what?” may be heard from Patheos Buddhist, if this should leak over there. But if prior discussions are any guide, some readers are saying “Oh! Yes, that’s it!” For several years I thought that my friend Mike Gurklis and I invented the term “Zen Pagan” in the late 1980s, but I’ve found that others have discovered it independently – including, interestingly enough, John Lennon. So if the term resonates with you in some way, you’re not alone. There’s much to say about this Zen Paganism: from how the Buddha obtained enlightenment while sitting under a tree and calling on the Earth to bear him witness, to the Greco-Buddhist culture that arose in Gandhara in the wake of the conquerors Alexander and Ashoka and gave us the first Buddha statues (styled after images of the Greek pantheon), to how Aleister Crowley’s roommate was one the first Westerners to become a Buddhist monk, on up through Mr. Lennon’s identification as a Zen Pagan and what it all suggests to us going forward. We’ll be investigating such topics in future episodes, but today I’d like to offer an introduction by telling you how I found a Buddhist deity of the Earth…or he/she (it’s complicated) found me. Friends, meet Jizō, the Bodhisattva of the Earth. It was the summer of 1992, if I recall correctly, and I was in the parking lot of a Grateful Dead show at RFK Stadium. Considering what usually goes on substance-wise around such events I may not be the only one to have had contact with a deity that day, but my introduction had nothing to do with psychedelic drugs. (Not that time.) It was about a work of art. 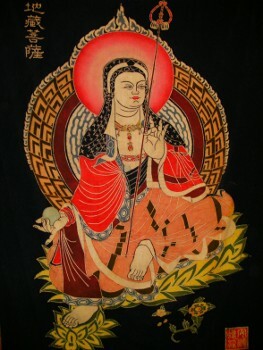 I walked past a vendor who had various tapestries and cloth paintings on display, and was caught by an image of an androgynous Buddha-like figure. I looked briefly and then walked on; I was in graduate school, money was tight, and I hadn’t come here to buy stuff. But something drew me back. “Do you know what those Chinese characters mean?” I asked. “Hmm. It means…’Earth Buddha’,” he replied. Earth Buddha! Now that was interesting. I had been bringing Zen and Taoist ideas and stories into our eclectic Pagan circles for about two years now, and here was a hint that there might be some sort of Earth religion in orthodox Buddhism. So I bought the painting and put it on my bedroom wall. That was all I knew about it for a few years. At one point I taught myself enough to try to look up those characters in a dictionary: the first was indeed “earth”, the second I couldn’t figure out, and the last two were “Bodhisattva” — not a Buddha, but a being of great compassion and wisdom. As the Zen teacher Jan Chozen Bays puts it, a Bodhisattva is “a person who is fully enlightened, completely awake to the Great Mystery, who could chose to merge with the Mystery forever, but looks back and sees others suffering and turns back from that merging to help the others.” [Bays, p.5] You may have heard of the great Bodhisattva Kannon, a.k.a. Avalokiteśvara, a.k.a. Kwan Yin, the figure sometimes called the Buddhist “Goddess of Mercy”. It turned out that this figure on my wall was another being of that order. A few years further on (sometimes it takes a long time to get the joke, doesn’t it?) in 2002, I had the opportunity to visit Japan thanks the hospitality of my friends Eric Wiegmann and Robin Gunkel. Eric used to be a Buddhist monk, and even though his background was in Tibetan rather than Japanese Buddhism he helped educate me as we toured various temples. One statue that we commonly saw, not just in temples but standing out at the roadside, was a bald-headed fellow often adorned with a bib, sometimes with children’s toys left in some sort of offering or memorial. Eric explained that this was Jizō, a guardian of children. And for a few more years (drawing out the joke) that was all I knew. 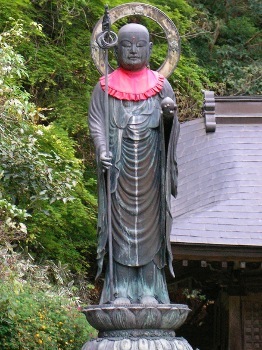 A Jizō statue in Minō, Ōsaka. I returned to Japan for three months in the spring of 2007, with the intention of learning more about the culture and religion. One day I visited the National Museum in Nara, and found an exhibit explaining more about Jizō. I learned that he is seen as a guardian of all those on the paths of rebirth, especially those in hell realms, and of travelers in general. As a traveler far from home this interested me greatly, so I turned to the web to learn more. I found that Jizō is portrayed carrying a staff that he uses to pry open the gates of hell, and a gem that lights the way. Hey, I thought, the figure in that painting hanging on my wall back home has a staff and a gem. Besides a rescuer of those in hell, and savior of children, Jizō is a patron deity for firefighters (who also enter into hells to save other beings). Where does the Earth enter into this mythology? The 14th century Zen master Bassui tells the story of a man who had not achieved enlightenment but had a very compassionate mind. So he spent his time building bridges and roads for the people to travel on. In this work he carried earth and mud on his back, until he realized that his own true nature was the same as that which he carried. And so the Buddha named him the Bodhisattva of the Storehouse of Earth, and his vast compassion was used as a metaphor to show that our true nature is everywhere. [Bays, p. 242] It’s an invocation of the Earth’s nature as that which supports us on every step of the journey. There is certainly more to this relationship between Buddhism and Earth religion, and we’ll get to that in some future episode when we’ll explore why the Buddha touched the Earth. You can learn more about Jizō in Jan Chozen Bays’s book Jizo Bodhisattva, and in the Wikipedia entry for Kṣitigarbha, his/her Sanskrit name. I’ll be reprising my role as Master of Ceremonies at this year’s Free Spirit Gathering, June 10-15 in Darlington, MD — you can join us for the week or for just a single night. And I’ll be presenting at the Starwood Festival in Pomeroy, OH, July 8-14. Bays, Jan Chozen. Jizo Bodhisattva : modern healing and traditional Buddhist practice. Boston: Tuttle Pub, 2002.